September 5, 2006  Scrabble in the Sky Lounge Anyone? It’s the 5th of September today and I’m calling you from Pheriche at 14,000 ft. (4267m). 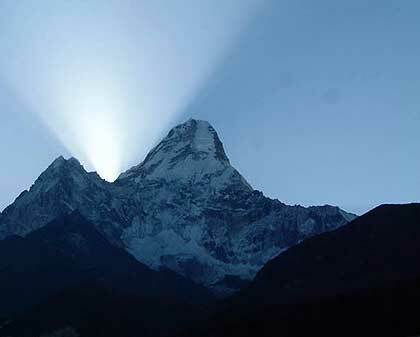 We woke this morning in Pangboche. 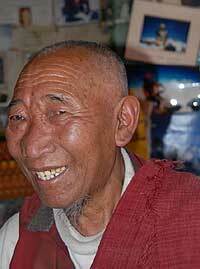 As some of you may know Pangboche is a very special place for us. The home and lodge of Ang Temba and his wife Yanzing is here and it is a real center or base for us. One thing about waking at Ang Temba and Yanzing’s lodge is when you have clear skies as we did today we go up to their dining room which we call the ‘sky lounge’ and look out the glass windows at Ama Dablam with the sun coming up behind it. The radio base station is going in at Ang Temba’s lodge that will allow for radio communication with Everest Base Camp as well as with Ama Dablam base camp later in the fall when that Berg Adventures expedition begins. It’s always a warm time to return to Pangboche and the lodge of Ang Temba, no less so this time. Dave and Sean had their scrabble board out, these two are quite competitive and are playing scrabble as soon as we hit the lodge where ever we arrive. We are really happy to still have Sean with us, our guest doctor on this trek. He has become a great friend and has enriched this trip for all of us in many ways. It’s really interesting with our weather, we have classic good, monsoon weather, pretty clear in the mornings, no winds visible really anywhere and then it does get cloudy in the afternoon. One notable thing about Everest this morning is that the clouds were formed on the lea side of the mountain, it didn’t seem like the winds were high up there but the clouds were formed on the Northwest side of the mountain rather than the South and East side as we often see Spring and later in the Fall. Wind direction up high seems to be different. Interesting observation for us. Also today we went to see Lama Geshi which is important to our expedition. He spent almost 4 hours with us and blessed all of us. As usual he had a wonderful sense of humor and a great laugh. 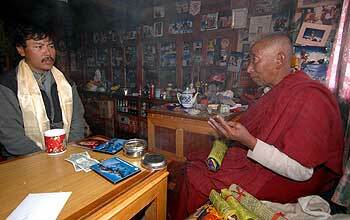 It was a special time for the entire team to know Lama Geshi would be praying for us throughout this expedition.